The Ships Tavern Elburton is a fantastic traditional pub/restaurant that serves high quality and good value food. We can also cater for any function. 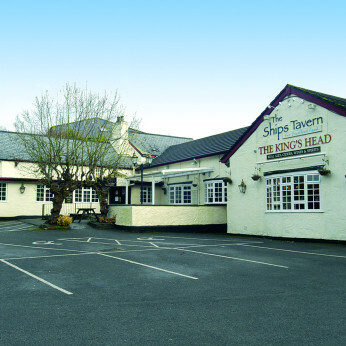 The Kings Head is the original building of what is now known as The Ships Tavern and The Kings Head, and was built sometime in the late 1600′s. The building is an original Devon longhouse that was initially used as a farm, later being utilized as a scrumpy house with it’s own cider press. It is believed that there is a secret room alongside the Kings Head that was bricked up some 200 years ago and no one has set foot inside since. It is also said that the building is haunted by 2 ghosts, though the present Landlord has yet to encounter them!